The spectacularly captivating and highly acclaimed “Harry Potter and the Forbidden Journey” thrill ride at Universal Studios Hollywood’s “The Wizarding World of Harry Potter™” takes a technological bow with the introduction of enhanced 4K-HD ride film projecting at an astounding rate of 120 frames-per-second and designed to offer guests an even more immersive glimpse into J.K. Rowling’s Wizarding World. This progressive enhancement replaces the earlier 3D film component of the ride to create a seamless integration between the ride’s elaborate sets and its spellbinding media. The attraction’s storyline remains the same. Originally projected at 60 frames-per-second, the new ride media now displays at twice the frame rate offering superior clarity and remarkably sharper images than previously shown, with imagery that is stunningly ultra-realistic. An achievement in pioneering theme park ride technology, “Harry Potter and the Forbidden Journey” is a multidimensional thrill ride located within Hogwarts castle. It features a groundbreaking robotics ride system, fused with elaborate filmed action sequences and immersive visceral effects designed to take guests on a once-in-a lifetime whirlwind adventure. Spiraling and pivoting 360-degrees upon an elevated ride track, “Harry Potter and the Forbidden Journey” ushers guests on a journey alongside Harry Potter, Hermione Granger and Ron Weasley as they venture through some of the most memorable scenes from the movie, including a Quidditch match where they narrowly escape a dragon attack, as well as close encounters with Dementors and the Whomping Willow. A spectacular attraction unto itself, the iconic and picturesque Hogwarts castle sits at the heart of “The Wizarding World of Harry Potter” providing access to Hogwarts School of Witchcraft and Wizardry. Hogwarts castle is a breathtaking reproduction from the movie, housing narrow stone passageways and chambers that invites guests to walk in the famous footsteps of the film’s heroic character where they will encounter many familiar places along the way, including the Mirror of Erised, Professor Sprout’s Herbology class and a selection of baby Mandrakes, Dumbledore’s office, the Defence Against the Dark Arts classroom, the Hall of Talking Portraits, the Fat Lady portrait at the entrance to the Gryffindor Common Room and the Sorting Hat. From its snow-capped roofs and cobblestone streets to the historic British sensibilities that characterize the whimsical look and feel of the land, “The Wizarding World of Harry Potter” transports guests of all ages to the very places they read about in the stories or watched on the silver screen. “The Wizarding World of Harry Potter” resonates with immense detail, inviting guests to revel in Harry Potter’s world with the opportunity to enjoy authentic food and beverages at multiple locations, including Three Broomsticks™ and Hog's Head pub, as well as the Magic Neep and Butterbeer™ carts. A foray through the shops adds to the authenticity of the land with eight retail venues and locations, including Honeydukes™, Ollivanders™, Owl Post™, Zonko’s™ Joke Shop, Wiseacre's Wizarding Equipment, Dervish and Banges™, Gladrags Wizardwear and Filch’s Emporium™ of Confiscated Goods. Universal Studios Hollywood is The Entertainment Capital of L.A. and includes a full-day, movie-based theme park and Studio Tour. As a leading global entertainment destination, Universal Studios Hollywood delivers highly themed immersive lands that translate to real-life interpretations of iconic movie and television shows. 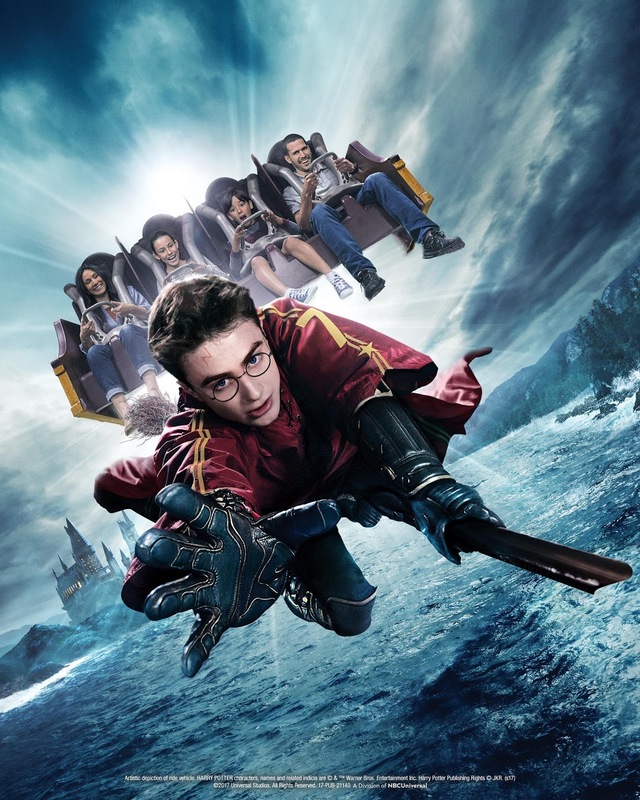 Recent additions include “The Wizarding World of Harry Potter ™” which features a bustling Hogsmeade village and such critically-acclaimed rides as “Harry Potter and the Forbidden Journey” and “Flight of the Hippogriff™,” Universal Studios Hollywood’s first outdoor rollercoaster. Other immersive lands include “Despicable Me Minion Mayhem” and “Super Silly Fun Land” as well as “Springfield,” hometown of America’s favorite TV family, located adjacent to the award-winning “The Simpsons RideTM.” and the “The Walking Dead” daytime attraction. The world-renowned Studio Tour is Universal Studios Hollywood’s signature attraction, inviting guests behind-the-scenes of the world’s biggest and busiest movie and television studio where they can also experience such authentic and immersive thrill rides as “Fast & Furious—Supercharged.” The adjacent Universal CityWalk entertainment, shopping and dining complex also includes the all-new multi-million dollar, completely redesigned Universal CityWalk Cinema, featuring deluxe recliner seating in screening room quality theatres, and the “5 Towers” state-of-the-art outdoor concert stage.